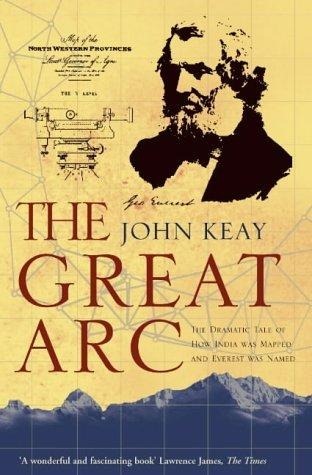 This is a review of “The Great Arc: The Dramatic Tale of How India Was Mapped and Everest Was Named” by John Keay. This book does exactly what it says in the lengthy subtitle: describe the Great Triangulation Survey of India which was conducted in the first half of the 19th century. It fits together with “Map of a Nation” by Rachel Hewitt and “The Measure of All Things” By Ken Alder. The former describes the detailed mapping of the United Kingdom by the Ordnance Survey, whilst the later describes the measurement of the Paris meridian by Méchain and Delambre. Of the three surveys the French one had been completed first at the beginning of the 19th century whilst the mapping of the UK was going on at the same time as the Indian survey. The book is centred around the Great Arc survey originally proposed by William Lambton at the beginning of the 19th Century. Lambton’s aim was primarily to measure a meridian (a line of longitude), in the same manner as the Paris meridian in order to gain more information on the shape of the earth (geodesy). For his sponsors in England and the administration of India the survey served as a military and commercial exercise. Military action is often a spur to survey, since getting your troops and their equipment from point A to point B and ensuring they prevail over any forces they come across on the way is a high-value activity which is greatly assisted by the provision of accurate maps. Surveying is also invaluable when you are planning infrastructure such as roads, canals and railways. The survey came a time when the British relationship with the area now known as India was changing from a trading one based on outposts to one in which the British took territory militarily. 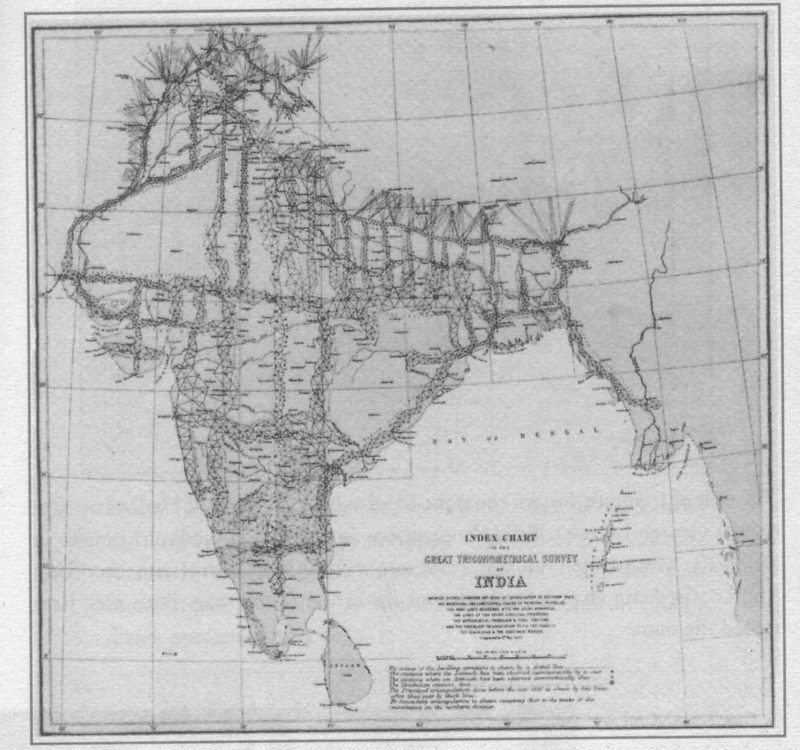 The Triangulation Survey was not exhaustive, it comprised a central spine (The Great Arc) running along the 78th meridian up through the tip of the Indian peninsular to the edge of the Himalayas with regular “cross-bars” running from West to East, towards the north an array of parallel meridians were also measure. (You can see a map here). 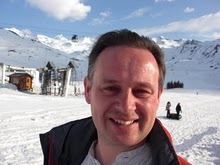 The aim was to use this survey to constrain further local surveys. The Great Arc survey was a great endeavour, taking 40 or so years in total, after Lambton died in 1823 George Everest took on the job of leading the project. Lambton seems to have been a pleasant sort of chap who went a little native, disappearing from the view of his sponsors. Everest, on the other hand, appeared to be a complete git – being abusive to most of his subordinates and apparently also winding up his superiors. Much of the activity in the book is in common with that which took place during the surveys of France and the United Kingdom. Laying out base-lines: distances measured directly on the ground by means of rods or chains used to pin down the distances in the “triangulation” which is a collection of angular measurements at the vertices of an array of triangles. Once again the precision is impressive, two 7 mile baselines measured out 200 miles apart agree with the triangulation measurement to within a few inches. Angular measurements were made using a theodolite, Keay labels the one used in India as the “Great Theodolite”, which I thought was a term reserved for the Ramsden device used in the UK (we can’t all have a Great Theodolite!). The Indian survey presented different challenges in the form of the wildlife (tigers, scorpions etc) but also disease. The rate of attrition amongst the surveyors, particularly as they traversed jungle was terrible. The book is not explicit about figures but in the later stages of the survey something like a thousand men were involved and a couple of hundred of those died of disease. Lambton and later Everest both suffered from recurring bouts of malaria. The “discovery” of Mount Everest and the tallest peaks in the Himalayas was somewhat incidental to the main thrust of the survey. It had become clear in the first decade or so of the 19th century that the Himalayas were the tallest mountains in the world but their precise height was uncertain. Political difficulties with Nepal, their location far from the sea and their immense size meant determinations were poor. Indeed at the time of the beginning of the survey the height of Mont Blanc in Europe was only know to within a thousand feet or so of its currently accepted value. It wasn’t until 1856, after the Great Arc had been completed and Andrew Scott Waugh had taken over the survey that Mount Everest (known at the time as Peak XV) was measured and Waugh proposed Everest be its name. (Everest is apparently pronounced Eve-rest rather than Ever-est, and the man himself was very particular about this). Put beside “Map of a Nation” and “The Measure of All Things”, “The Great Arc” is a nice, brief introduction to the theme of triangulation surveys and geodesy which covers measuring the height of mountains in a bit more detail than the other two. The Great Arc survey, along with the French meridian survey fit together with the earlier French Geodesic Mission to Peru by Condamine and Bouger around 1735, which is described in “Measure of the Earth” by Larrie G. Ferreiro – I’ve added this to my wish list. You can see my Evernotes on The Great Arc here. Thank you for sharing your notes and this entertaining book review !